I love angling. I love Japan. So when I read about two years ago about Tenkara USA I knew immediately that it is something I need to try. Since then, I fished a few times with my tenkara fly fishing gear, and have kept a steady eye on the developments of the company. I always liked them, great videos, great website, great service. So I got in touch with the founder of Tenkara USA, Daniel Galhardo, and he happily agreed to an interview. If you're not yet hooked on tenkara [pun intended], I bet you will be after this interview - enjoy! Daniel, please briefly introduce yourself and tell us who you are. Since when are you fly fishing, and how did you start? How often are you outdoors on a fishing nowadays? I have always been drawn to the outdoors, and took every chance I got to be outside. I grew up in Brazil, and moved to California when I was 17 as an exchange student. From just about day one in California I was fascinated with the mountains here, very different from the tropics of Brazil. In large part I stayed here for the mountains, I love rock climbing, trout fishing, and also surfing. And California has opportunities for all of these. I’m probably not out as much as I wish I could be, but this last year I probably managed to be outside – fishing/backpacking/etc – some 100 or so days, mostly fishing. I’m striving for a 4-hour workweek (see more below on that) so I can be out more often, and so I can do more tenkara fishing – though I guess that can be considered work for me, so I hope to work non-stop. Are you also a backpacker? If so, what is your typical baseweight, and do you combine backpacking and fly fishing? I love backpacking. Backpacking is one of the things that attracted me to tenkara to begin with since the rods are so compact and light, and they are a perfect fit with the ultra-light backpacking philosophy. I’m not quite ultra-light, as I enjoy a few small comforts and food when I go backpacking, but I hate carrying a lot of stuff. In the last couple of years my wife and I have gotten our packs down to total weight (including food) of about 7kg for mine and 4.5kg for hers for a 3 day trip (most of our trips). We do things like sharing one sleeping bag (but carrying a silk liner each), using tenkara and little fishing gear, catching some of our food, and carrying little water by following streams. Daniel's wife on a tenkara backpacking trip. I absolutely combine backpacking with fly-fishing. I choose all my routes based on whether they follow a stream or lead to a stream. I also much prefer mountain streams to lakes. This saves me from carrying a lot of water, but most importantly, ensures the scenery is always a little different and that I can stop and fish whenever I want to. What is your favorite backpack, sleep system and shelter? Any other favourite piece of gear which you always carry with you? I like my Granite Gear Vapor Trail pack, a Big Agnes Seedhouse for 2 for my wife and I. We use ¾ foam pads, often share a sleeping bag and use silk liners - probably my favorite discovery for backpacking; it is expensive so it took me some time to want to buy it, but well worth it for backpacking and travelling, at about 100grams it adds 9 degrees of warmth, it can be used alone when travelling and since we share a sleeping bag it keeps some of the little draft out. Can you tell us how the idea to start Tenkara USA emerged? Was easy to quit your previous job? This can be a very long answer, as there are a lot of things that came together and happened through my life to inspire Tenkara USA, and for me to jump in with both feet and make it happen. I have been fly-fishing for most of my life. I also studied business, with a focus on entrepreneurship. My family has many entrepreneurs, some started successful business, others have tried and failed more than once. I think I have always liked the idea of making my own decisions, taking full control of my life. For a while I had been thinking of how cool it would be to mix my interest for business, and the desire I had to start a business of my own, with fly-fishing. In fact, when I was about 14 years old I started tying flies, and since Brazil didn’t have many things for fly fishing I thought I would start selling them, I even drew some business plans for a fly shop, thinking I would want to do that some day. A few years ago I heard of tenkara, did more research, thought it would be very cool to try it. Then, I got to visit Japan for my first time with my wife, who is Japanese American. While visiting Japan I go to see the rods, and bought myself one. 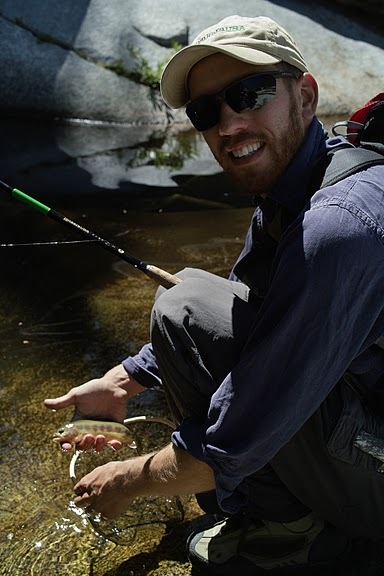 When I returned to California I realized how perfect tenkara was for stream fishing and for backpacking. I started looking for more information and realized there was no one talking about it here, and almost no information in English. Very quickly I thought this would do very well here, and I thought about how cool it would be to start a business and create a market for tenkara. To create a brand new category in an old industry. And so I did it. I started working on the business almost as soon as I landed from my first trip to Japan. Daniel's office, which is a bedroom in their current apartment, featuring a “tenkara museum”, with items ranging from flies tied by a family that has been tying flies for 430 years, a collection of rare tenkara nets from Japan, and a couple of tenkara bamboo rods among a few other items. I had a very stable job in foreign exchange at one of the most secure groups of the most stable bank in the US. The economy was turning bad, and the idea of leaving a very good job to start something in a recession was a scary one. But, the more I worked on creating the business – while still in my job – the more I understood the market, and started getting some very good products designed and made, the more confident I became that the business would be very successful. Most people I spoke to thought it was too risky; some encouraged me to stay in my job and run the business on the side, others suggested I shouldn’t leave my job. But, in the end it was my decision – it also helped that we don’t have kids or an expensive mortgage, and I figured I didn’t need much money to survive. In the past, I had many business ideas, I even briefly started working on some; but this time it was different. I knew telescopic rods very well, I knew fly-fishing, I knew mountain stream fishing, I knew I could create demand for tenkara while making very good products. There was a very strong sense of confidence this time. So, I left my job a month before I officially launched Tenkara USA to focus my entire attention to it, and I’m very glad I did. You're a "new kind" of cottage manufacturer in terms that you concentrate on what you do best - R&D, sales and marketing - and outsource the other factors of running your business. Was this an easy decision, or were you planning on doing it all yourself at some point? How you see the future of the company? Tenkara USA is very largely inspired by Tim Ferriss’ book, “The 4-Hour Workweek ”. The book talks about how to create a business that can be automated, based on processes and outsourcing, to liberate a person and allow one to do what he wishes, “lifestyle design” as Tim calls it. I first read the book about 1 year before thinking of tenkara. Then, when the idea for Tenkara USA came up I immediately went back to the book to put it into practice. Of course, I work much more than 4 hours a week, but that’s when I choose to and I do it because love my business. The great thing about automating, and delegating/outsourcing, is that I can work 4 hours a week if I choose to. Outsourcing most of the business operations, working with other companies to do certain things (like shipping) has been a no-brainer to me, it was a very easy decision, and I wouldn’t do it any other way. I have seen many people work like crazy, and very quickly the business owns them, instead of them owning the business; that is the last thing I want. The 4-hour Workweek has served as a huge roadmap for me. Tenkara USA was also largely inspired, and is run based on certain philosophical principles shared by Patagonia’s founder, Yvon Chouinard, in his book “Let My People Go Surfing ”. Although I have no full-time employees, I do strive to make sure Tenkara USA develops an excellent reputation for its products, and that we can form strong relationships to tenkara anglers. I try to continually improve our products, and make sure they get a lot of use in the field. While The 4-Hour Workweek is my operational roadmap, Let My People Go Surfing is my philosophical guide to running the business. I like how we have created a very strong bond with very passionate customers, who love our products and the concept of tenkara. I want to continue running Tenkara USA to have fun, and introduce tenkara to people - to get people to realize that fly-fishing is very simple. What the future holds, who knows? That is what will keep it very interesting. How easy, or difficult, is it to compete versus the mass market manufacturers of fly fishing equipment? We really don’t compete with other fly-fishing manufacturers or anyone else. 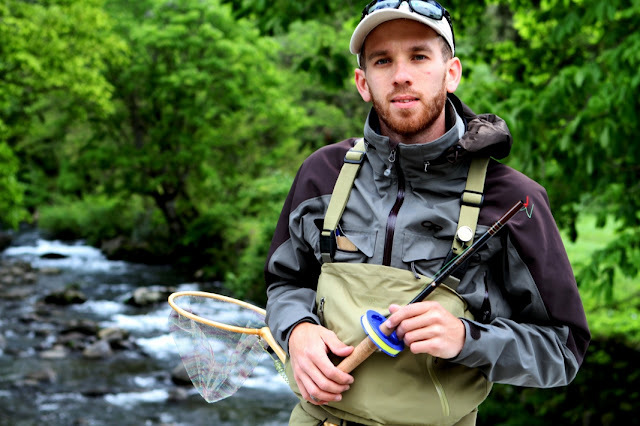 The beauty of having created a brand new category in the fly-fishing industry is that we really have no competitors, Tenkara USA is the first one to create this market. The challenge has been to create demand for a product no one has ever heard of before. Some people in the industry feel a bit threatened by the introduction of tenkara, and by the fact that we tell the public that they don’t need a reel for stream fishing, that they don’t need dozens of fly patterns, or expensive fly lines to fly-fish. However, we have also introduced many new people to the sport of fly-fishing. 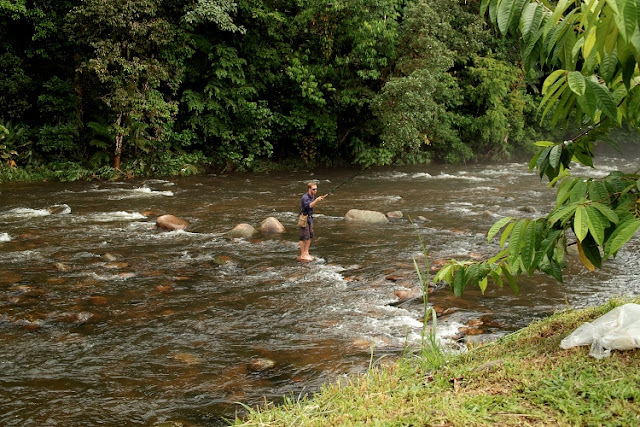 Backpackers who have thought of fly-fishing were too intimidated by it, for example. I always get comments from people about how they felt like fly-fishing was too complicated, too intimidating for them, and how they like the approach of tenkara, which is simple. I imagine it isn't easy to convince normal fly fishers of the advantages of tenkara fishing, or am I mistaken? It is amazingly easy to show fly fishermen with a lot of experience the advantages of tenkara. Of course, some fly anglers are very set in their ways and not very open to new ideas, perhaps that is part of the demographics. But, generally speaking, once people see that they can enjoy some additional simplicity, that they don’t need to carry a lot of stuff to fish, and they see how the long rod and light line allow for drag-free drifts and precise manipulation of the fly and that there is an actual technique to it, then they fall in love with it. Interestingly, most of our customers fall in two categories: people with very little experience fly fishing (e.g. backpackers who always wanted to try fly fishing) or people with A LOT of experience fly-fishing. You can’t imagine how ecstatic I was when I learned that Yvon Chouinard, the person I largely inspired my business on, and who was named Angler of the Year by Fly Rod and Reel, had recently become a full time tenkara angler, and we have converted many respected and experienced fly fishermen to fish tenkara. This has been very encouraging to me. Daniel, we love to be let in on the work-in-progress stuff! Can you let us know what kind of new products you're working on at the moment? Currently I’m finalizing development of a longer tenkara rod, probably around 4,5 meters. Developing a very long tenkara rod is tricky. A very long tenkara rod can be a huge asset to reach pretty distant spots while keeping the line off the water and precisely delivering the fly. But, it’s difficult to get the balance just right and the feel good. I have been spending the last 3 months on this design, going through several prototypes, but it should be here in time for the new fishing season. Like all rods I have designed, they go through a lot of testing, and I make sure they are perfect before releasing them. And, if they never get there, they never come to market. How does the R&D at Tenkara USA work? Do you have a need yourself that you try to fix, or do some of your clients inspire you for new products and ask you for solutions to their problems? Most of my R&D consists of me specifying exactly what I want, then working with a team of engineers at our suppliers, and finally trying on a lot of prototypes over a good period of time until I feel very comfortable with the product. I am pretty good at knowing how a tenkara rod should feel, and only want to develop products I will want to use myself. I try to keep our product line as simple as possible, so I try not to offer products that will not dramatically enhance our product line. I listen to feedback from our users very intently, especially about what may not be working. However, since tenkara is so new here, and I know about it more than anyone else outside of Japan, I rely on my knowledge and feedback from tenkara masters that I am close to in Japan more than anything else. Preparing trout over a fire. What is your bestseller, and where do your customer come from? Product-wise our sales are very well divided among the rods. The Iwana rods sell a little better than the others, as it has a good price point, and is a very good place to start, but each one has a niche. The Amago 410cm sells better to those people regularly going after slightly bigger fish (>45cm) or fish larger/ more open rivers and even lakes, the Yamame for the bigger fish in regular sized streams. The Ebisu has a wooden handle, which is very different from anything out there, and some people feel more sensitive. The Ayu is a softer feeling rod, and at 390cm it offers very good reach, and casts very light lines well. And the Iwana are great standard rods, offered in 330cm for smaller streams, or 360cm for the general use. Our customers come mostly from regions where there are mountain streams, and they come from all over the world. In fact, so far near 15% of our customers are from overseas. We have a lot of customers in Italy, recently many in Russia, and a lot more than I expected in the Nordic countries too, including Finland (thank you for helping spread the word on this Hendrik!). Because of this I set up distribution for our products in the UK too, and products going to Europe ship directly from our warehouse there – customers in Europe now don’t have to pay for duties, and shipping is inexpensive and fast. So, “Tenkara EU” is also up and running. Are you in touch with other cottage manufacturers in Europe, USA or other places? Boring answer: no, not really. What is your own favorite fly fishing setup and target fish? I’m a trout angler, pretty much exclusively. I grew up fishing for all types of fish, but finally realized I truly love fishing mountain streams. The water is running and clear, every step up or downstream looks different, the stream changes at every turn, rocks are covered in moss. I carry a very small box of flies, I bought this box at a $1 store and it is full of flies in the same pattern (I only use one fly pattern, which is normal for tenkara fishermen, but in a couple of different sizes and colors). I normally carry 2 spools of tenkara level line, one at 4.5meters and the other at 6meters, and I try to fish with different rods, but mostly I use the Ayu which I think matches me (I like the longer rods as the streams I fish are normally open, and I like the soft feel of the Ayu). When and where was your last fishing trip, and how was it? Are you planning to get out for a trip soon? It is winter now. My very last fishing trip was actually a skiing trip; my wife and I went cross-country skiing and there was a nice stream nearby, so I carried my rod with me, but only fished for about 1hour as she wanted to keep skiing. My last very memorable fishing trip was in September, when my tenkara master, Dr. Ishigaki, came from Japan to spend a week in California. We were joined by Chris Stewart (the Tenkara Bum from New York), and fished a few different streams for 4 days. I continued to learn much from Dr. Ishigaki and we had a lot of fun. Tenkara is so simple on the surface, but I’m always amazed at how much I continue to learn about it. I’ll be spending 2 months in Japan this year to learn everything I can about tenkara, and hopefully more Japanese. Do you think tenkara fly fishing will become more popular and break into the mass market, or will it continue to be something for a small group of people? I think tenkara will always be a relatively small niche market. It is becoming widely adopted by backpackers, and small stream and mountain stream fly fishermen, it is ideal for them. There is good potential for a lot of people to adopt it, but it will never be like bass fishing, that’s for sure. I hope every person who enjoys backpacking or mountain stream fishing will at least give it a try. Daniel, thank you for taking the time to answer my questions =) Is there something you would like to add? Fly fishing is simple, or at least it can be! Don’t be intimidated about fly-fishing. Don’t get caught up with articles, books or videos that make it look like it is complicated. Fly fishing is one of the simplest activities around. You need a rod, line and fly, to know 3 knots and to go to a stream and try to catch a fish. With tenkara I wanted to show people how simply fly-fishing can be.